2. “Snap and Save to Album in playing page.” You can take a shot of a particular perspective. For example, you can change the view to little planet, then press the new snapshot button to save the little planet view to your Camera Roll. 3. Insta360 watermark/logo is now removable. It can also be changed to a white logo, or a picture of the Insta360 mascot. 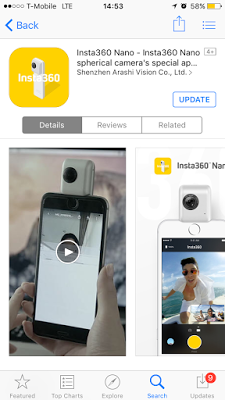 The ability to remove the Insta360 Nano watermark / logo addresses one of my chief complaints against the otherwise quite capable Insta360 Nano (preliminary review here). I’m updating the preliminary review. I’m also posting a review on or before Wednesday July 27.